GINGER RED – mit der charismatischen Sängerin „The MAD“ und einer liveerfahrenen Band möchte sowohl live als auch im Studio vor allem eines zeigen: die Freude am „Ginger-Rock“! Wenn man nachfragt wie sich die Band selbst einordnen würde, bekommt man die Antwort: „Nostylisch“! (eine Mischung aus nostalgisch und stylisch). Man darf gespannt sein! 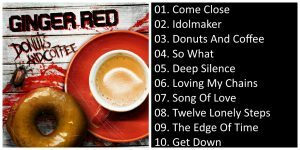 On their new album „Donuts And Coffee“ GINGER RED stand for fresh and cheeky rock with fat riffs, grooving rhythms and catchy hooklines. The high demand on their own music has often made the band’s motto „Good things take time“: after its founding in 2006, the debut album „Hard As A Rock“ was released in 2010, followed by a tour with the PRETTY MAIDS and various other concerts. From this era, only guitarist and band founder Tom Weise is left and so it took another few years until a new cast was found that could fulfill the high musical goals. „We wanted to make something new and fresh, but do not deny the origin of Ginger Red,“ said Tom Weise. 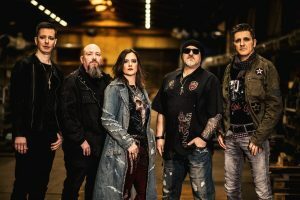 GINGER RED – with the charismatic singer „The MAD“ and a live-experienced band wants to show one thing above all live and in the studio: the real feeling of „GingerRock“! For this purpose, they have teamed up with the very renowned producer Fabian Zimmermann / Hafen Studios to implement all the ideas in the best possible way. „Without any pressure, but still with a high demand on themselves, GINGER RED has immortalized itself in a fresh, clear album, which perfectly combines the high-end guitar riffs with the melodic hooklines and matching lyrics.“ continues the band’s founder. The result is 10 songs full of enthusiasm and rock feeling, which are refined by several guest musicians.These are Chris Green (TYKETTO), Manni Schmidt (REFUGE), Mattias IA Eklundh (FREAK KITCHEN) or Frank Pané (BONFIRE, SAINTED SINNERS) to name a few. If you ask how the band would classify themselves, you get the answer: „Nostylisch“! (a mixture of nostalgic and stylish). You can be curious!